Marc Nash was the boss permanently with Anthony Woodhouse and Chris Moore as his assistant and coach respectively. What an opportune time for Paddy Atkinson to bring his greatly improved Terriers team to the Bay. Paddy, Mr Angrypants, wasn't all bad apparently since, I was informed, he had paid for tracksuits for the team when he arrived at the Bay. What a nice man...he's gone up in my estimation then. Still without the Shankster, who was watching on, it was the same team as Saturday's win but with Callum Anderson coming in for Professor Wilkinson. Callum had certainly changed the game along with Kyle Patton when they had come on in Washington so it was good to see him getting a start. Keltie and Allen were working well together in midfield and it was the Bay who started the strongest. Twice Kyle Fryatt jinked his way towards goal. the first time he ended with a trickling shot and the second, he ended up flying perfectly through the air to land in an undignified heap. Then it was Robo's turn to get a good chance but the chance was missed when he should have taken a shot first time. It was nice to see our favourite Pixie in goal: ex WAC keeper, Jak Wells but this time he arrived complete with a new haircut. Gone were the flowing grungy locks to be replaced by an old school Justin Bieber look. Next time we see him...the skinhead? The Bay were playing some great stuff but Flynn still needed to be on his toes when the Terriers' Kyle Oliver hit a shot that screamed past his left hand post. Next it was the Kempstervator who found Justin Bieber's legs too tricky to nutmeg. The lino was doing his best to help out the Terriers when he informed their left back how poorly he was doing in playing our forwards offside. "Unfair!" we cried. Finally, a fantastic cross from Callum Munroe was met by Robbo's bullet header. Justin was not happy! We were delighted to welcome back a fit again Tommy at the Tea Emporium after a period out of the kitchen through illness. Boy, can that man make tea.....and errrr, hot chocolate. The Padster had obviously had a quiet word with his team as the visitors took control of the second half. 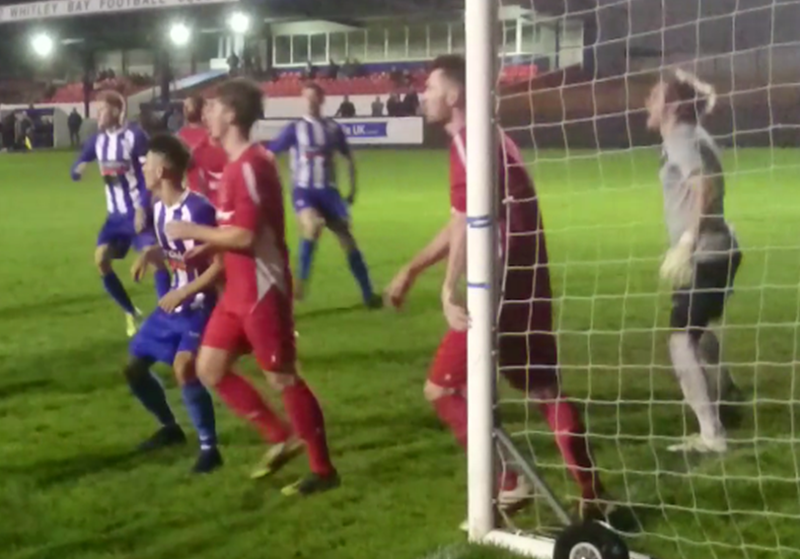 Another great fingertip save from Flynn kept the visitors out, then it was a lobbed effort from the half way line that had Tommy boy backpedalling. Thankfully it just drifted over. Whitley's luck ran out when the Terrier's Paul Wardle left Flynn grasping air as he headed home. Back came the Bay, however, and it was the General who met a magical cross from the wing wizard Potter with a volley over his shoulder. There was more delight as the Kempstervator headed home, allegedly with his eyes shut, on his 150th Bay appearance. He was pleased with that! Next, it was Supermac with a screamer from outside the box that the Bieber-like had no chance with. We were then in heaven when Robbo attempted a perfect reverse-flick-cross-type-thing that landed in the visiting crooner's relieved hands. Moira, just returned from her holiday in South Africa...we've seen the photos...then told him to watch his language and just "Try to Laugh it off." Jak just looked at her and replied "Do I look like I can just laugh it off?" with a cheeky smile before launching into a rendition of "No Pressure" from his 2015 album Purpose. 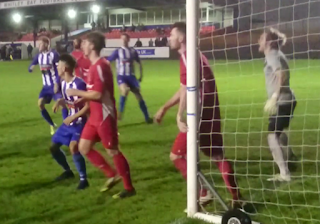 As the goals dried up for a while, we contented ourselves by singing Spinderella and Salt and Peppa's "Push It" before we were sent into our final moment of ecstasy for the evening...A wonder-strike from youngster Jack Cooper! Could have been the chant....but instead we admired the new Aldi on driving out the Car Park. We were still in a cup!